This great lightweight (only 1.7lb!) Iwata Freestyle Air Battery-Powered Airbrush Compressor is designed for low pressure applications such as bridal and runway make-up, cake decorating, hobby applications and temporary tattoos using thinner mediums. It is ideal for on-set make-up and any low pressure application where mobility is essential. Use your air compressor on the go! 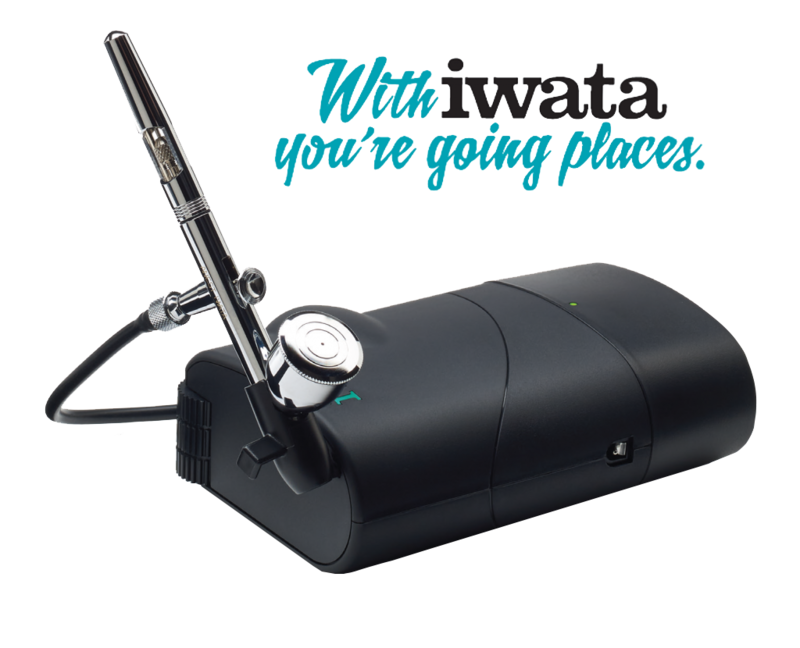 With its 3-speed rolling switch ranging from 5-19 PSI, the Iwata Freestyle Air powers most gravity-feed airbrushes and can be used with other airbrush brands. It is best in class for portability and power. Use the Iwata Freestyle Air plugged in or with the rechargeable NiMH battery. The battery is fully charged within one hour and can be charged on or off the compressor unit (battery charges when the unit is plugged-in but not in use). With a full battery charge, run-time is approximately 45 minutes at 10 PSI. The Iwata Freestyle Air is equipped with an auto-protect feature that turns the compressor off after 9 minutes. To turn the compressor back on, slowly roll the on/off switch in any direction.